Everybody and their grandma has asked me to add the RX200 to the Mod Range calculator. Now I’ve bought an RX200S, and three Sony VTC4 batteries for testing, along with five 1Ω 100W resistors. Let’s find the max output voltage and current. But first things first. I haven’t watched many reviews of this mod, and I’m not going to right now. Better to approach the mod with an open (i.e. ignorant) mind. Before I cobble together a test setup, I’ll poke about some, and get to know the mod. Look at that. Apparently this upgrade also increases the output from 200W to 250W. Oh well, I’ll roll with it. The VTC4s should be able to cope just fine. When initiating charging by USB, the Wismec slowly ramps up the USB current. That is good, and in accordance with the USB standards. Charging from the USB3 port on my PC, the USB current tops out around 1A. Decent enough. Charging from a wall wart, I was hoping for maybe 2A, but like so many other mods the RX200 seems to be a capped at 1A. Charging from a healthy PC USB2 port, it also sits close to 1A, maybe 920 mA on average. No particular need for USB3 or wall warts then. Charging from a somewhat fried PC USB2 port (a tripped polyswitch, maybe), the Wismec limits the USB current to around 500 mA, possibly because it wants to keep the USB voltage over 4.5V. No problem there. All in all, it seems like the RX200 has a reasonably intelligent charging algorithm, at least on the USB side of things. The instruction booklet that came with the Wismec recommends charging the batteries externally, and says that the RX200 will issue a warning if the voltage difference between the cells exceeds 0.3V. Fair enough, it has no internal balancing then, but as long as it senses the voltage, and cuts off both charging and discharging at safe voltages, I’m okay with that. I’m going to charge my batteries in a dedicated charger anyway, because it is faster as well. First impression: It feels like it’s firing hot? Or is it just placebo from the hefty weight and the rated power of the device? I think I’ll have to measure the output to see how accurate it is, in addition to finding the maximum values. All in all, the vaping experience is not bad. I soldered some wires onto an old dripper deck, and found my 1Ω resistors. First to find the max voltage. I connected three 1Ω resistors in series using some solderless connectors. The mod told me that this was 3.23Ω, which is fine, as the connectors probably contribute with some extra resistance. Right away the mod displayed 9V on the screen, and refused to go any higher than 25.1W. Seems legit. My multimeter says 8.98V on the posts, which is close enough. Out of curiosity, I added a fourth resistor in series. Not surprisingly, the mod gave me a “No atomizer found” message. Enough with the high resistance voltage testing. Let’s see how much current we can get out of this thing. 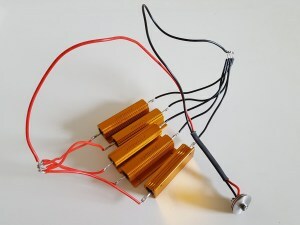 Now I soldered all five 1Ω resistors in parallel, and soldered the leads from the atomizer deck to my new 0.2Ω load. The Wismec read 0.23Ω. I’m guessing that the extra 0.03Ω is from the 510 connection. In any case, I don’t have an LRO, so I’ll trust the Wismec for now. In go the brand new, freshly charged Sony VTC4 batteries. 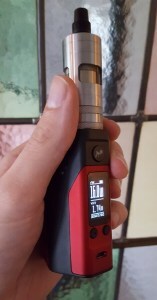 At the 250W setting, the Wismec displayed 7.58V. My multimeter measured 8V at the terminals. The resistors were getting warm, and so were the wires. The batteries stayed pretty cool, though. Ok, that’s enough heat for now. 8V / 0.23Ω = 34.78A. I’ll call that 35A. I’m beginning to wonder if it can put out more if the resistance is even lower. 34.78A * 8V = 278.24W. That’s way more than advertised. Hmmm. This is my first attempt at measuring a mod, let alone a high power one. I’m sure my methodology has much room for improvement. Right now I’m impressed with what this device can put out, but I’m surprised that the power is higher than what it says on the box, and the voltage is higher than what the display says. My multimeter is a cheap one, but not that cheap, and voltage measurements isn’t typically where cheap multimeters fall through anyway. Perhaps there is PWM, or some kind of ripple. That could throw off simple multimeter measurements. Yes, I should put the mod on the scope, and have a look at the waveform. But is late at night now. To be continued/updated tomorrow, after I’ve had some sleep.